One of Bob Baker’s articles posted on The Book Designer has recently caught my attention. To Succeed as an Author, Get Your ASK out There! Although all writers I know are people-persons, I don’t know many who are comfortable with pushing their book into the hands of potential readers and buyers. On the other hand, most writers don’t have a problem talking about books they like and about writers who deserve to be read. So I thought I would ask you to pay a visit to the following writers who in addition to their blogs have also published a book in the last twelve months. This book held the ingredients that instinctively draw me to a story: family saga told through three generation women, people torn between two languages and cultures, the first novel of a young writer. So it made sense for me to read it. But I wasn’t expecting to learn about the history of Taiwan. We all belong to a place that shapes us. Jennifer has successfully linked a personal event to a page of Taiwan’s history. And added Jack, an interesting male character, to the classic trio of women. You can read more about Jennifer and her writing on her blog. Writers of all genres will find helpful tips in this practical and honest book. Practical because Joe provides clear and specific tips on how to write and market in the 21st century. Honest because he doesn’t pretend that it is easy or will produce instant results. Joe has managed to write a book for writers who aren’t high tech experts but are aware of the importance of social media and online presence. I wasn’t looking for writing help, but you will find helpful tips in this area as well, and also humorous nuggets on how to live a healthy writer’s lifestyle. You can read more about Joe and his writing on his blog. This very personal memoir offers a glimpse of a life transformed by cancer. The fear, the physical pain, the ups and downs, the support of friends and family, the clumsiness of acquaintances, the care provided by nurses and doctors: everything is documented as in a journal. It could be too much, yet I found the memoir deeply positive. Friend’s visits, descriptions of the seasonal changes – yes, life goes on even when we are very ill – of food cravings – funny and touching at the same time – of poems and TV shows, which accompany Anthony as he goes through his treatment and his warm and realistic relationship with his wife and children – I have a weakness for the boy, the youngest – all touched me because it comes from the heart of someone who loves life. Because Anthony is British, there is also a lot of humor – never hurts, especially in a book that tells of living with cancer. There are also beautiful sentences throughout the book. It is no surprise, though, as Anthony is also a poet. This little book should be left in oncologists’ waiting rooms. You can read more about Anthony and his writing on his blog. Well, I thought when I was finished, I’m not so sure I‘ve followed Bob Baker’s advice. But do I really have to ask people to check out my book? 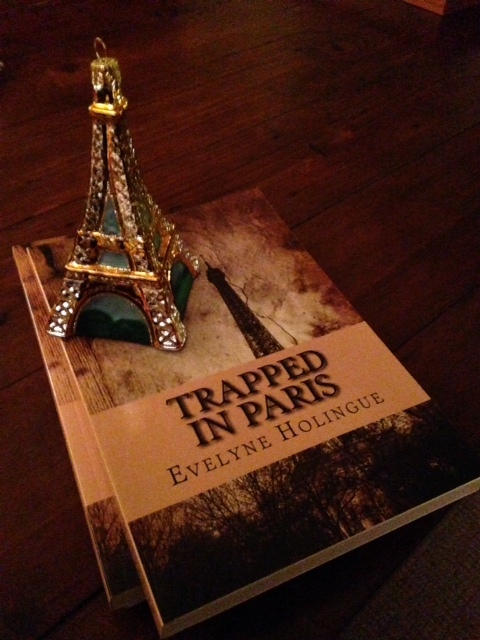 You can read what other readers wrote about Trapped in Paris on Goodreads where you are welcome to add a review, too. If, like me, you are a late holiday shopper and still have a gift to make to a young teen in your life, a book is a great choice. A printed and electronic version of my novel are available on Amazon, but your bookseller can order it through their distributor as well. Phew, I really got my ASK out there.